Just as a terrestrial globe cannot be flattened without distorting the distances, it seemed impossible to visualize abstract mathematical objects called flat tori in ordinary three-dimensional space. 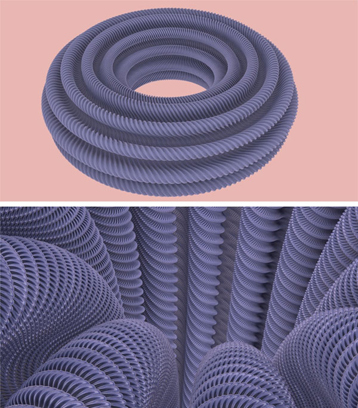 However, a team of mathematicians and computer scientists(1) has succeeded in constructing and visually representing an image of a flat torus in three-dimensional space. This is a smooth fractal, halfway between fractals and ordinary surfaces. The results are published in PNAS. In the 1950s, Nicolaas Kuiper and the Nobel laureate John Nash demonstrated the existence of a representation of an abstract mathematical object called flat torus, without being able to visualize it. Since then, constructing a representation of this surface has remained a challenge that has finally been met by scientists in Lyon and Grenoble. On the basis of the Convex Integration Theory developed by Mikhail Gromov(2) in the 1970s, the researchers used the corrugation technique (oscillations). This reputedly abstract mathematical method helps to determine atypical solutions to partial differential equations. This enabled the scientists to obtain images of a flat torus in 3D for the first time. Halfway between fractals and ordinary surfaces, these images show a smooth fractal. Image showing the isometric embedding of a square flat torus in 3D space, seen from the outside (above) and from the inside (below). Different oscillation waves, called corrugations, can be distinguished. Together, the corrugations form an object that resembles a fractal and has a rough appearance. (1) The team brings together four researchers from Institut Camille Jordan (CNRS/Universités Claude Bernard Lyon 1 and Saint-Etienne/Ecole Centrale de Lyon/INSA de Lyon), GIPSA-lab (CNRS/Grenoble-INP/ Universités Joseph Fourier and Stendhal-Grenoble 3) and Laboratoire Jean Kuntzmann (CNRS/Universités Joseph Fourier and Pierre Mendès France/Grenoble-INP/INRIA). (2) Mikhail Gromov was awarded the 2009 Abel prize for "his revolutionary contributions to geometry". The prize rewards major contributions to mathematics.